Small size Eye Shadow Brushes with total Length of 5.5 inches, made for self use by consumer in Synthetic hair and Pony hair. Bulk Orders only. Due to our client centric organization, we offer Eye Shadow Brush in diverse technical stipulations. Our patrons can avail these products from us in customized option as per necessities. We are highly recommended among our patrons for providing top quality products. An extra-fine tipped synthetic fiber brush that delivers a precise, firm, even stroke with which to line the eyes. Use with liquid or cream products. This brush helps to blend eye shadow shades. 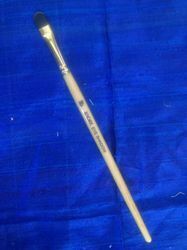 We are offering Eyeshadow Brush. This professional smokey eye brush set. feature eco-friendly bamboo handles and soft bristles with an anodized aluminum ferrule. Hand-crafted brushes. Professional anti-bacterial brushes. Eco-friendly products. Basicare angled eyeshadow brush is made of soft nylon bristles for hygenic purpose and precise application. This brush is excellent for contouring shaping and blending. it is ideal to use with cream Or Powder eyeshadow. This Slim Eye Shadow Brush is made of high quality raw material and is sure to last long.